Actually, it is more than that. The 124-page graphic novel was originally published in four chapters of 32 pages each. The reader still has the choice of whether to buy it as a single hardbound volume at $29.95, or as four separate magazines at $2.95 each. The first chapter, “The Baxendale Cruise”, begins the tale in the past, but on page 27 it suddenly jumps “28 years later …” and we are in District 14 in the present, specifically District 14, Season 2. Lady Rozenbilt – I have translated the French “richissime” as “fabulously rich”, but “the richest woman in the world” would not be out of place – is giving a swank soiree and cruise on her luxurious seaplane, a virtual flying palace, to her private tropical island. She is human; her guests are a mixture of humans and anthropomorphic animals. Her staff are all anthropomorphic animals, including notably Mister Bund, her otter pilot, Alfred Bigoodee, her cat seaplane mechanic and general servant, and Martha, her antelope maid. The Bunds and Bigoodees have otter and cat families, although there are later fertile interspecies families. Lady Rozenbilt is obviously one of those super-rich who considers herself above the laws for “the commoners”. For her upper-class guests’ entertainment, she has “rented” two notorious criminals including Russel Kemper, a psychotic mass-murderer from Death Row, and bought a not-for-sale, one-of-a-kind endangered marine monster. Each is imprisoned in an escape-proof glass-&-metal cage. Lady Rozenbilt’s guests include her nephew and heir, Walter, an insufferably arrogant young doctor. Walter is outraged to discover that his elderly aunt has fallen in love with a nouveau-riche boyfriend, Lawrence Simonson. He is sure that he is about to be disinherited in Simonson’s favor. The reader can’t tell what Walter considers most offensive; that Simonson has vulgar, low-class manners, or that he is a dog. Walter offers to free Kemper if he will kill Simonson for him. The psychotic Kemper decides to kill everybody, with tragic results although Alfred escapes. 28 years later, the cat-man Alfred, now Captain Bigoodee, learns that Kemper’s murder-spree was not as extensive as it looked. There may have been other survivors. Alfred is determined to find out. This book, in full color by Delphine Rieu (District 14 is in black-&-white), answers many of the questions that District 14 raised, although it raises a couple of questions of its own. 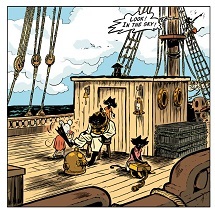 Who are the two human children seen only in one panel on page 109, panel 8? While the story is full of tragedy, those who deserve it come to a happy ending. The Extravagant Cruise of Lady Rozenbilt is a complex, mature adventure full of romance, cynical humor, gentleness and brutality, disgust and suspense. For those familiar with District 14, Season 1 or the recently-published District 14, Season 2, it presents the return of old friends and clears up most of the mystery about them. For those who have not read District 14 yet, it is an enticing introduction. 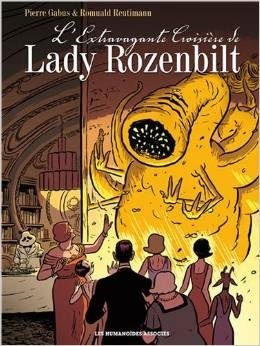 For those who do not want to read the lengthy District 14 (over 600 pages), Lady Rozenbilt is a satisfying stand-alone tale. It is also a skillful blend of anthropomorphic animal protagonists in a serious science-fiction adventure, segueing back and forth between the past and the present. 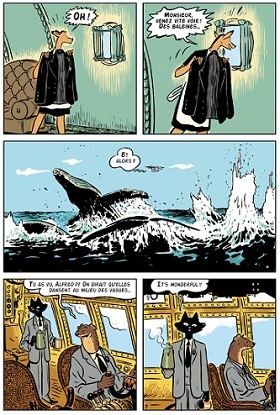 This may be a comic book, but the story has complexity and depth. Reutimann’s art is so good that this album would be worth looking through even if there were not an English edition available. Get it, or at least the American edition if you do not read French! Here are enlarged samples of the first 12 pages, but in French. Lawrence Simonson is the gray dog seen in page 12 (sample 11 of 12), panels 2 and 3. The Humanoids catalog has more samples in English.